Although they are commonly mistaken for a yellow jacket, they can easily be identified by their distinctive flight, their long legs that dangle below their bodies, and their unmistakable open combed nest that can be found on nearly every house. Unless you have over 15 active Polistes nests, they are so common that we typically only collect them from locations in which we are already removing yellow jackets or hornets. In the springtime, an overwintering queen (the “foundress”) or a small group of foundresses will initiate the construction of a nest. They begin by fashioning a petiole, or short stalk which will connect the new nest to a substrate- often the eave of a house or an outbuilding. They build a single brood cell at the end of the petiole with further cells built around it in a hexagonal pattern. Their nests do not damage the structure to which they are attached! Roughly two months after colony initiation, the first workers emerge. These new females take on foraging responsibilities, caring for brood, and maintaining the structure of the nest. The reproductive phase of the colony begins when there is a switch from the production of workers to the production of queens and males. These future foundresses and males emerge from their brood cells and disperse from their natal nest for mating flights. Inseminated females gather in groups of up to fifty individuals and seek a sheltered location (called a hibernaculum) in which to overwinter. None of the workers or males survive the winter in our climate. 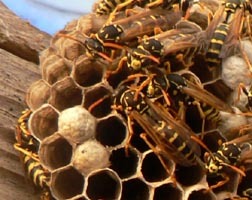 Polistes wasps are extremely temperature sensitive and will not fly unless the temperature is warmer than 65 degrees. They are considered beneficial insects because of their predatory diet of caterpillars and other insects. They are non-aggressive in defending their nests, and we very rarely hear of folks getting stung by them. They have to be provoked into being defensive! If you leave them alone, they'll surely leave you alone. Polistes aurifer is a Polistes wasp that is native to the Puget Sound. 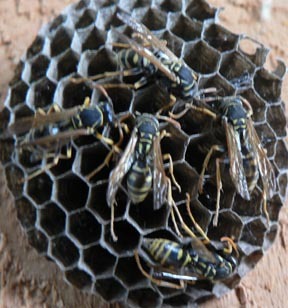 They have small nests usually 2-3” in diameter with 6-10 wasps on a nest. We find them on about 5% of the houses we go to for removals. 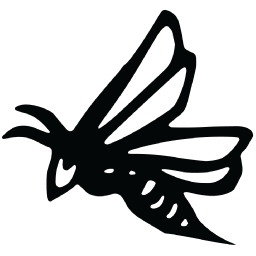 For more information on mud dauber wasps and sand wasps, please see the page on solitary species. Polistes nests are very common and unless you have more than a dozen active nests, we only collect them from places we are already removing hornets or yellowjackets.